Trump raised North Korea at an annual White House meeting with the nation’s governors after a North Korean envoy sent a message through South Korea on Sunday. The envoy said the North has “ample intentions” of holding talks with the U.S.
Vice President Mike Pence was all set to hold a history-making meeting with North Korean officials during the Winter Olympics in South Korea, but Kim Jong Un’s government canceled at the last minute, the Trump administration said Tuesday. “We want to talk only under the right conditions,” Trump said. The administration’s position is that North Korea must get rid of its nuclear and missile programs before any talks can take place. The U.S. has applied a series of sanctions, including a fresh round on Friday, in what it says is a “maximum pressure campaign” to force North Korea to disarm. The Trump administration says it’s open to talks with North Korea, primarily to explain how America will maintain its pressure on the country until it takes steps toward eliminating its nuclear weapons. U.S. officials differentiate talks from negotiations. For those to occur, they first want Pyongyang to accept that its nuclear program will be on the table. 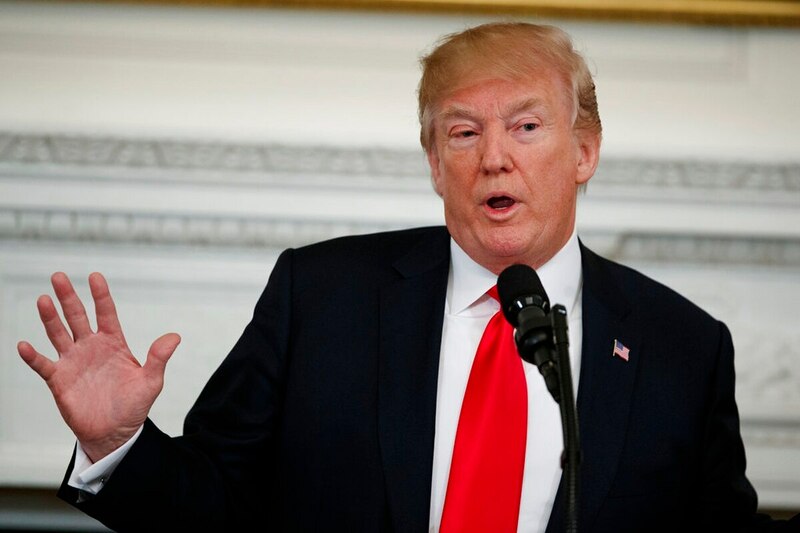 Speaking to the governors, Trump praised Chinese President Xi Jinping for bolstering his country’s sanctions against the North and warned that Russia is “behaving badly” on the issue of sanctions. “Russia is sending in what China is taking out,” Trump said. During Sunday’s closing ceremony for the Olympics Games, the office of South Korean President Moon Jae-in announced that a North Korean delegate to the Olympics said his country is willing to hold talks with the U.S. The move comes after decades of tensions between the two countries, which have no formal diplomatic relations, and a year of escalating rhetoric, including threats of war, between Trump and North Korean leader Kim Jong Un. The North has “ample intentions of holding talks with the United States,” Moon’s office said. The North’s delegation also agreed that “South-North relations and U.S.-North Korean relations should be improved together,” the statement said. White House press secretary Sarah Huckabee Sanders said Sunday that the U.S., South Korea and the international community “broadly agree” that denuclearization must be the outcome of any dialogue with North Korea. She said North Korea has a bright path ahead of it if it chooses denuclearization. Trump once scolded Secretary of State Rex Tillerson, who favors diplomacy with North Korea over military confrontation, for “wasting his time trying to negotiate with Little Rocket Man,” which is Trump’s derisive nickname for North Korea’s leader. At the Olympics opening ceremony earlier this month, the North Korean leader’s sister, Kim Yo Jong, shared a VIP box with Moon and Vice President Mike Pence, who led a separate U.S. delegation, creating some awkward moments. Though Pence stood to cheer the entrance of the U.S. team, he remained seated when athletes from North and South Korea marched together behind a “unification” flag, leaving Moon to instinctively turn around and shake Kim’s sister’s hand. Pence and Kim Yo Jong did not speak. Pence’s office claimed afterward that the North pulled out of a planned meeting at the last minute. 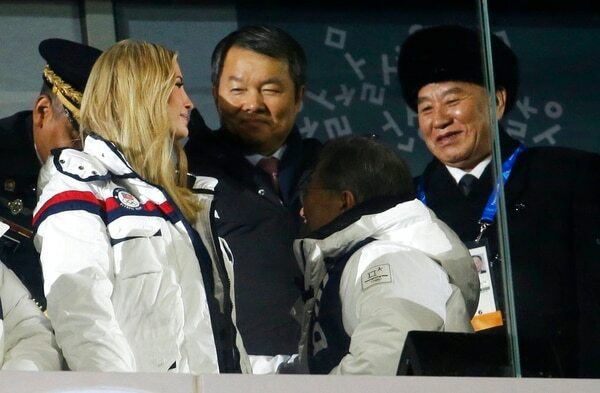 During her visit, Ivanka Trump sat in the same box with Kim Yong Choi, vice chairman of North Korea’s ruling Worker’s Party Central Committee. They did not appear to interact when Jae-in shook hands with dignitaries at the beginning of Sunday’s closing ceremony. Trump has vowed to use force if necessary to prevent North Korea from acquiring a nuclear-tipped missile that could strike the U.S. mainland. At a White House news conference on Friday, he warned that the U.S. would move to “phase two” in its pressure campaign if sanctions don’t work. Trump said such a step could be “very rough” and “very unfortunate for the world.” He did not elaborate. “If we can make a deal it will be a great thing. If we can’t, something will have to happen,” Trump said.